Enjoy a day of golf at Shanty Creek, at the Legend, Hawk’s Eye or the Chief. 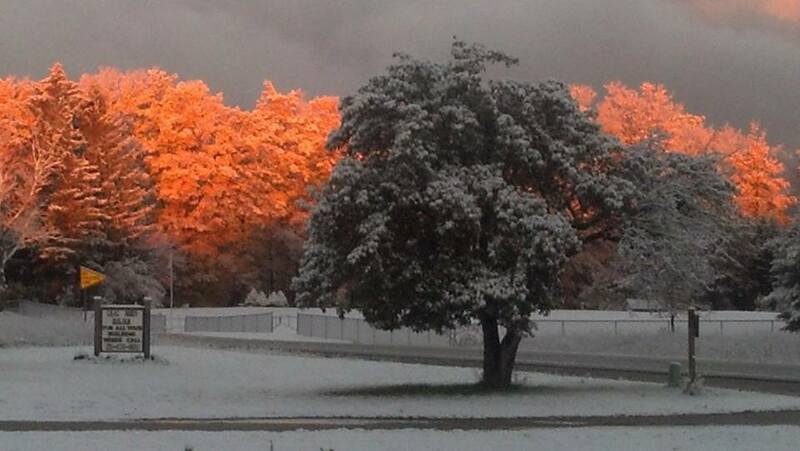 Just a short drive south you will find the beautiful Grandview Golf Club in Kalkaska. Experience the hiking, birding and biking trails at both the Grass River Natural Area and the newly created Glacial Hills Pathway and Natural area in Bellaire. Kayak or fish the beautiful Jordan River in East Jordan. 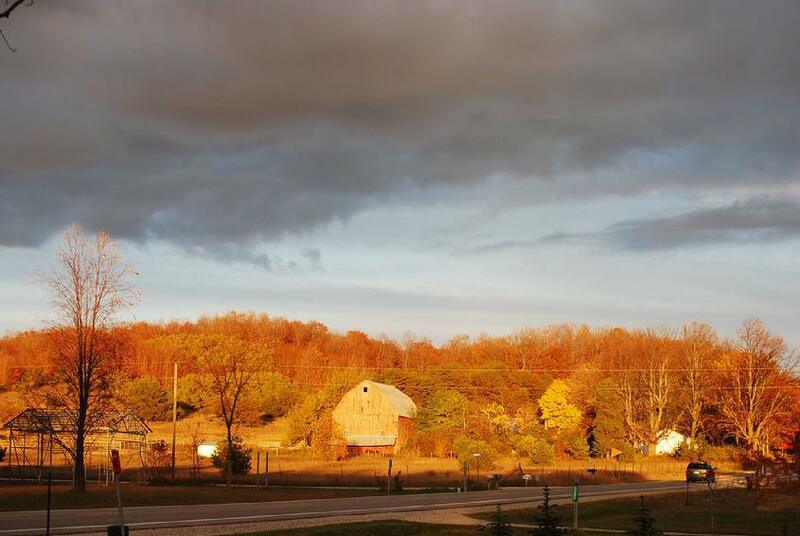 We are only 35 minutes from Traverse City, the Leelanau and Old Mission Wineries and 90 minutes either way from Sleeping Bear Dunes or Mackinac Island. Whether you are looking for an active outdoor weekend, week long vacation filled with amazing day trips, or an intimate getaway, we have what you need. 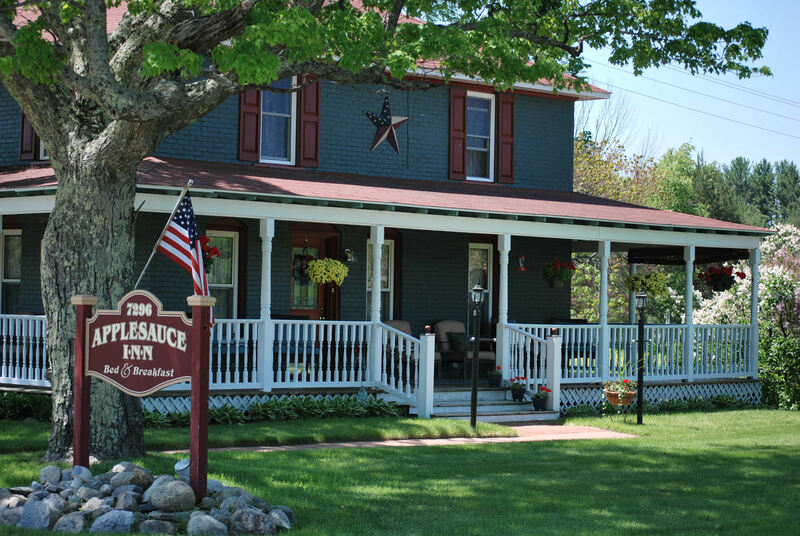 Make the most of your Michigan getaway vacation, and consider the Applesauce Inn Bed and Breakfast as your home away from home. 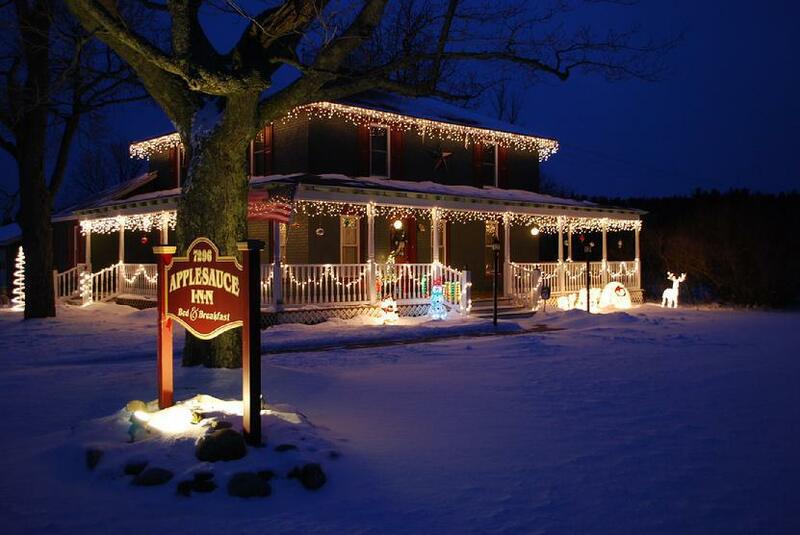 Our commitment to you is that whether you have stayed in a bed and breakfast before or not, you will be comfortable here, you will leave relaxed and you will be making plans to return! Room rates shown are for one or two adults and do not include 11% taxes/fees. The Napa Room (private bath) The Napa room is our largest room and is located on the second floor. 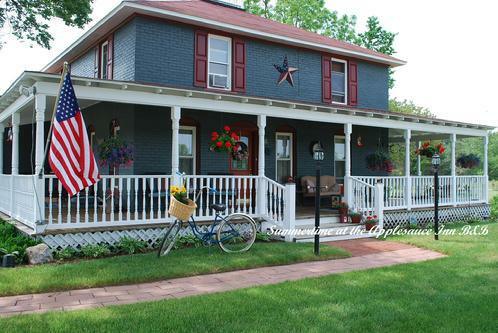 It offers beautiful old hardwood floors, cherry queen sleigh gSnuggleBedh with a pillow top mattress, alternative down blanket, fluffy pillows, a large matching dresser, antique Gentlemanfs closet and beautiful cherry mantel electric fireplace. There is a small sitting area, 22 flat screen TV with cable/On Demand programming, high speed Wi-Fi, summer a/c, plush robes, wine glasses, ice bucket and private bath with large walk in shower. 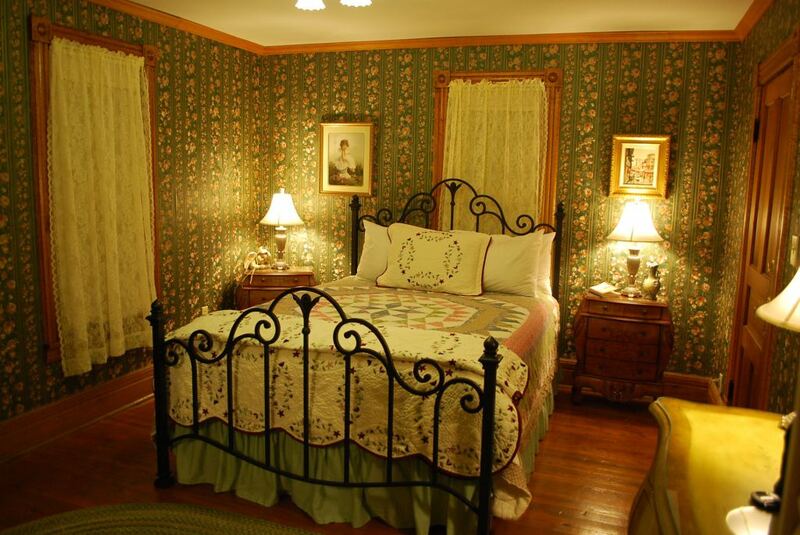 The Sonora Room (private bath) Our only 1st floor room, offers the most private location and is decorated with an old Victorian Western feel of soothing greens and lovely roses, original birds-eye maple trim and warm hardwood floors. 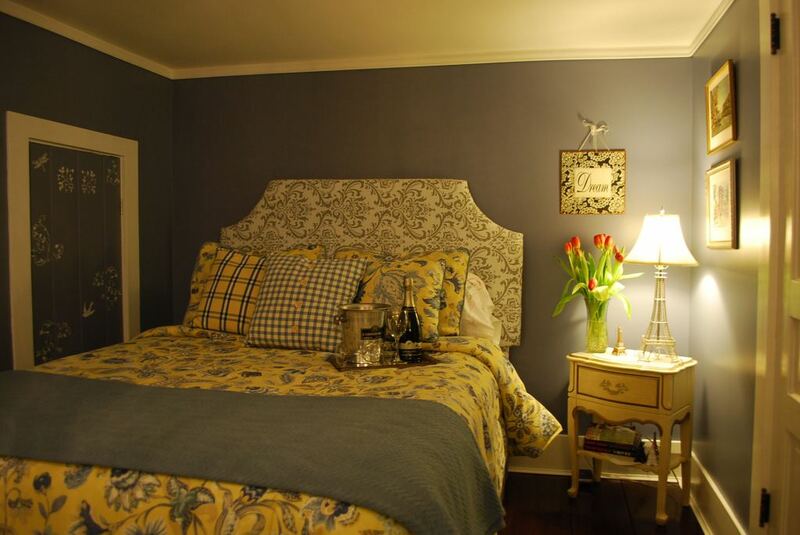 A welcoming queen wrought iron gSnuggleBedh, features a comfy pillowtop mattress with down alternative blanket, fluffy pillows and vintage quilts. Our Sonora room features hand painted vintage furniture, a wood burning style stove electric fireplace, summer a/c, 22 Flat screen TV, cable with On Demand programming, high speed WI-FI, wine glasses and an ice bucket. The large private bath features a tub/shower combination, bubble baths and bath salts for you to enjoy a lovely warm bubble bath. 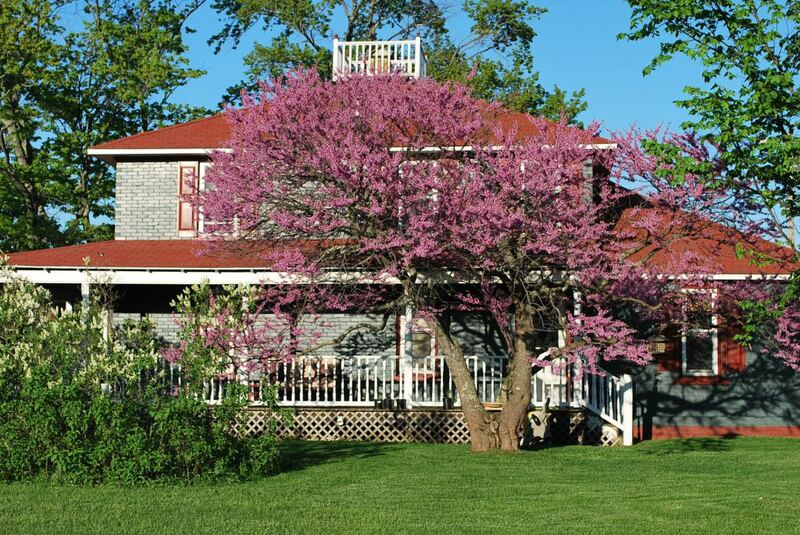 Direct access to the charming Parlor and front porch along with garden level views make this room very popular. Only guest room with a walk in closet. The Carmel Room (shared private hallway bath) This classically styled room is located on the 2nd floor and it includes the same amenities as the larger rooms at a lower cost: A beautiful upholstered headboard features a comfy queen size pillow top gSnuggleBedh, blueberry muffin painted walls, crisp white crown moldings and trims. The dark wood floors make this room a timeless classic. 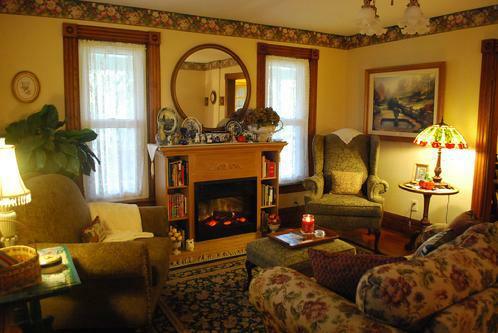 A small seating area for reading is tucked near the cozy wood stove style electric fireplace. A 19 flat screen TV, expanded cable with On Demand, high speed WI-FI, summer a/c, wine glasses, ice bucket and plush bath-robes are all provided for you. 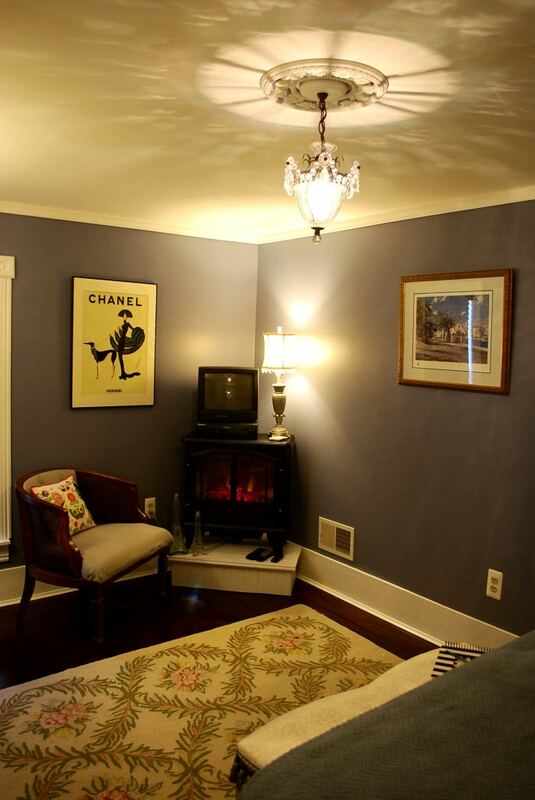 This room shares a charming private hallway bath and features a vintage 1916 claw foot tub/shower with wonderful bubble baths provided so you may enjoy a warm bubble bath. 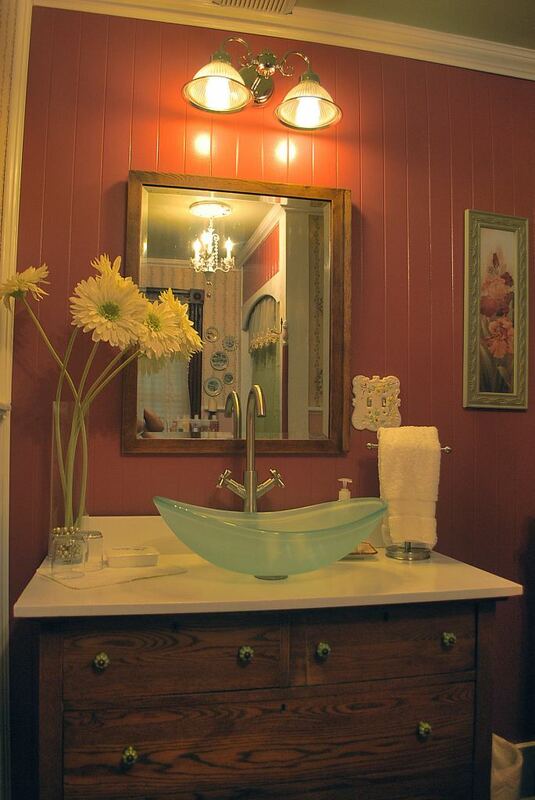 NOTE: (This bath is shared only with the Innkeepers, and is not shared with other guests. 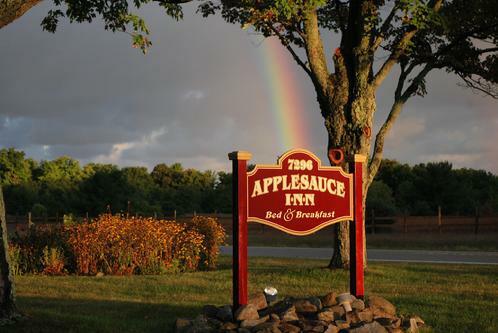 It is cleaned everyday) The Applesauce Inn Bed and Breakfast offers charming and comfortable guest spaces for your relaxation and enjoyment. 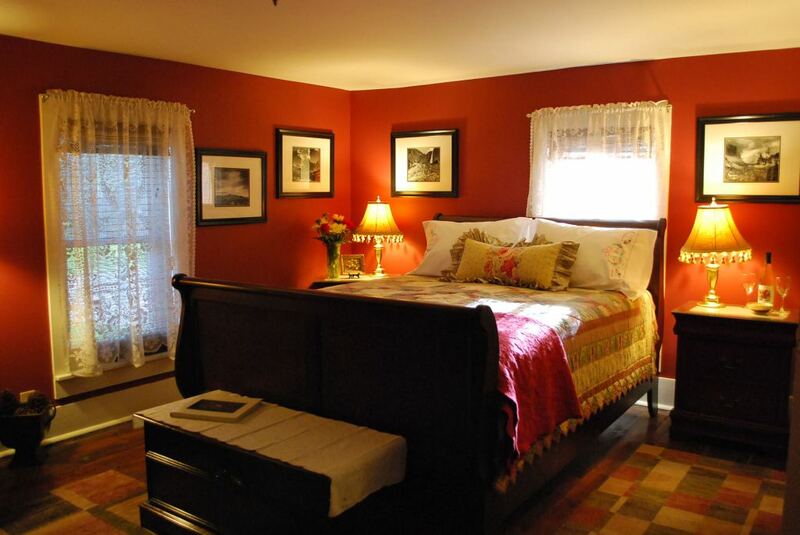 All areas feature original wood floors, woodwork and trim. 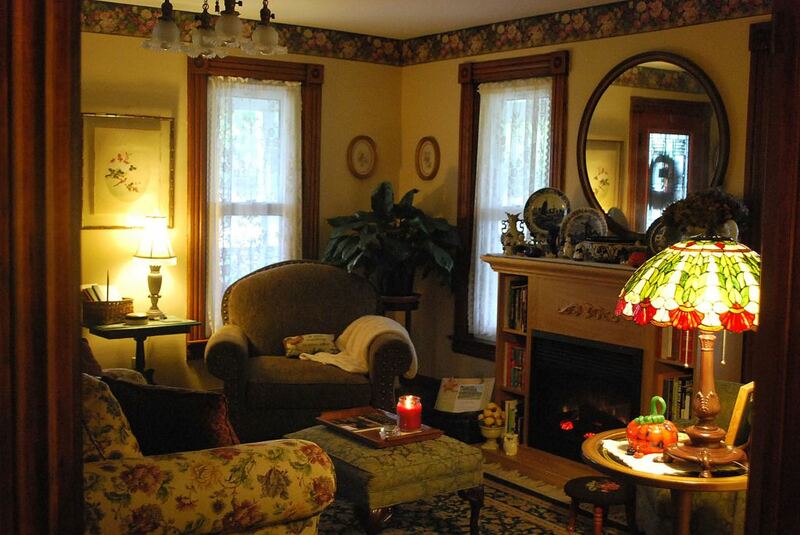 The Guest Parlor has comfy seating, many different books to read, VHS movie library, cards, vintage board games, cozy electric fireplace, and direct access to the covered porch and parking area. This area functions as the main guest entry and gathering area; youfll have a key to come and go as you please. The Sonora room is accessed directly from the Parlor. The Guest Dining Room is adjacent to the Parlor and is a great place to gather, play cards, etc. A full plated breakfast is served here at 8:30 am each morning with coffee available at 7:00 am. A small guest fridge is stocked with bottled water. Hot beverages, home baked cookies and various snacks are available 24 hours a day for your refreshment. During the summer months (June-October) dessert is served here each evening. In the summer months (June-Aug), we will offer a locally featured wine pour every evening (a guest favorite). The Covered Wrap-Around Porch is the perfect three season retreat and adds to the spaces designed for guest relaxation and enjoyment. Watch the hummingbirds feed and the goldfinches frolick and sing! Public areas do not have TVfsceach room has a Flat screen HDTV/VCR, and guests are welcome to enjoy cable TV or a movie from our library.